The Sounder Active EOL peripheral is a sounder circuits active EOL Device. Sounder circuits can be configured for compliance with EN54-13 by programming the use of this peripheral. In order to comply with EN54-13 all panel sounder outputs must be fitted with the Sounder Active EOL. The Sounder Active EOL is a small and compact active end of line unit, designed for termination and housing in third party sounder output devices. 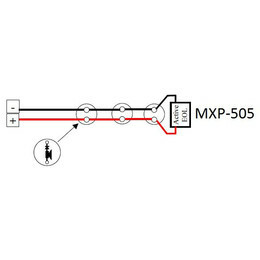 In order to comply with EN54-13, The MxPro 5 system must check and warn (prior to an alarm condition) if the voltage at the last device cannot be maintained under the applied alarm load conditions. In order to meet this requirement, the Sounder Active EOL active EOL is required for all panel sounder outputs. By using this device, third party accreditation assures compatibility as all components are individually tested and certified to the relevant harmonised product standard. This ensures that the system will fully operate, as intended, when actually needed. For use with EN54-13 Compliance. For use with all MxPro 5 series control panels.